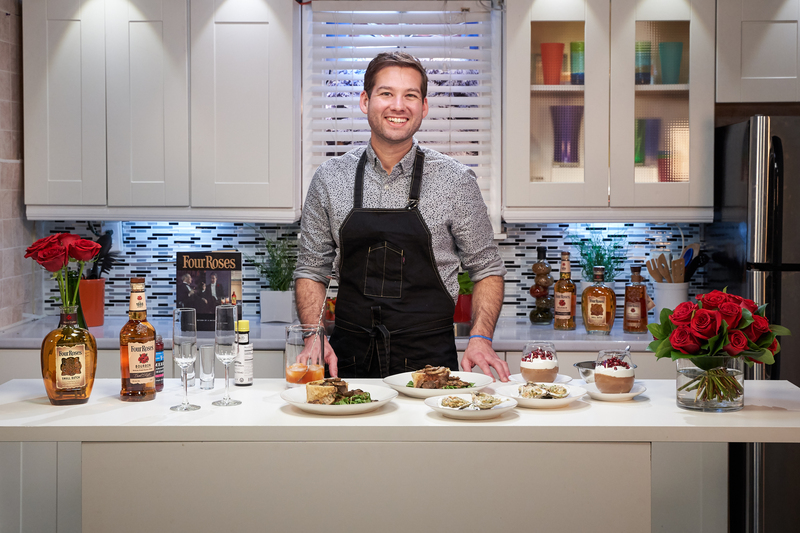 We partnered with our friend Chef Robert Ramsey and The Daily Buzz to create a Four Roses inspired three-course Valentine’s Day dinner, complete with a Four Roses cocktail, of course. Check out the video and recipes below. Don’t forget to share with us on Facebook, Instagram or Twitter if you handcraft for your valentine this year. 4. 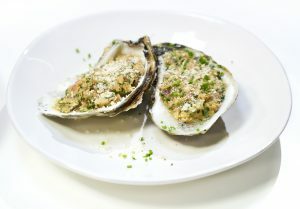 Place 1 heaping tablespoon of the flavored butter on top of each oyster. 5. Grill the oysters until the butter melts and bubbles, and the oysters become plump, about 4-5 minutes. 1. Liberally season the beef tenderloin with salt and pepper on all sides. Place a large, heavy saute pan over high heat. Add enough oil to create a thin coating on the bottom of the pan. Add the beef and sear until a dark crust is formed, about 3-4 minutes per side. When done, place the beef on a wire rack and transfer to the refrigerator to cool. 3. Using the same pan, reduce the heat slightly and add the mushrooms. Saute the mushrooms until they reach a deep brown, stirring often, about 8 minutes. Season with a pinch of salt and pepper, then transfer the mushroom to a bowl, reserve. 4. Add the shallots to the pan and saute until they start to brown slightly, this will happen very quickly. CAREFULLY deglaze by pouring in the bourbon. The alcohol will flambee (or catch fire), this is normal. Cook until the fire burns off, then add the thyme, stock, and the cooked mushrooms back into the pan. Reduce the sauce by approximately ⅔ over medium heat. Stir in the butter. Reserve. 5. Remove the puff pastry from the freezer. Allow to warm up just a bit, until it becomes pliable. 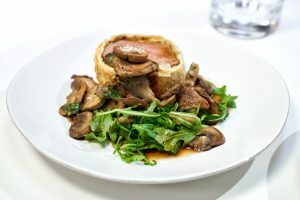 Once the beef is cool enough to handle, place it on top of the puff pastry and wrap the pastry around the beef. Place it seam side down on a baking sheet and transfer to the oven. Roast until the pastry is golden brown and crispy, about 20 minutes. 6. Place the beef on a cutting board and allow to rest at least 5 minutes after it is removed from the oven. Meanwhile, toss the arugula briefly in the pan sauce until just slightly wilted. 7. Divide the pan mixture between 2 plates and then slice the beef wellington in 2. Place one half on each plate. ● 1 cup whipped cream. 1. Put 2 individual serving glasses in the refrigerator. 2. Bring the heavy cream and sugar to a boil in a small saucepan and remove the pan from the heat (don’t just turn off the burner). Stir in the bourbon and vanilla. Add the chocolate and let it sit for 5 minutes without stirring. Whisk the chocolate and cream until smooth and then transfer the ganache to a large bowl. Don’t refrigerate. 3. In a medium bowl, beat the egg whites and the table salt with a hand mixer on high speed just until they form stiff peaks when you lift the beaters. 4. With a rubber spatula, fold about one-quarter of the beaten whites into the ganache to lighten it. Then gently fold in the remaining whites, taking care not to deflate them. 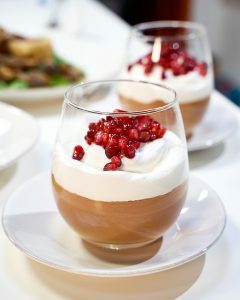 Divide the mousse among the chilled glasses and refrigerate for at least 30 1 hour and up to 24 hours. 5. Top with a sprinkle of maldon sea salt, then a dollop of whipped cream and a handful of pomegranate seeds. 2. In a pitcher or cocktail shaker, pour the bourbon, orange liqueur, and bitters over ice. Stir for at least 30 seconds. Strain the mixture into champagne glasses, being careful to evenly divide. 3. Top with the sparkling wine. Garnish with an orange twist.